Travis Pastrana completed over 400 feet of jumps last night, breaking three of daredevil Evel Knievel’s own records. 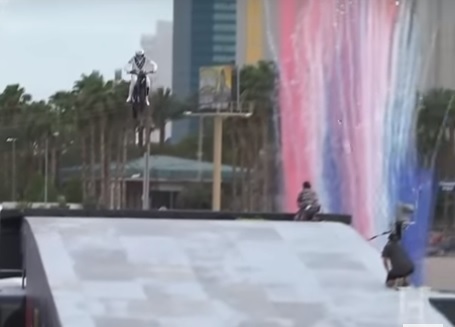 Mounted on an Indian Scout FTR750, Pastrana jumped 143 feet over 52 crushed cars, 192 feet over 16 Greyhound buses, and finally 149 feet to clear the fountain in front of Caesars Palace hotel and casino. Pastrana even donned his own red, white, and blue costume in honor of Knievel, cape and all. Knievel, who passed away in 2007 at age 69, crushed his pelvis and broke several other bones attempting the same fountain jump on New Year’s Eve in 1967.